The Smart Siddur gives you the Prayers of each day. For Example, in Rosh Hodesh it displays Yales Ve'yavo and Halel, while in regular days it doesn't. In addition, it has a great user interface, and it's most easy to use Siddur application in the market. A dynamic smart Siddur with all the prayers you need, updating automatically without internet connection required. A complete and full Hebrew calendar integrated with a Gregorian calendar for easy navigation. Daily Zemanim for almost everywhere in the world. Nikud may be a little tricky, due to Android devices incompatibility. स्मार्ट Siddur आप प्रत्येक दिन की प्रार्थना देता है. नियमित दिनों में ऐसा नहीं होता है, जबकि उदाहरण के लिए, रोश Hodesh में यह Yales Ve'yavo और Halel प्रदर्शित करता है. इसके अलावा, यह एक महान यूजर इंटरफेस है, और यह बाजार में Siddur आवेदन का उपयोग करने के लिए सबसे आसान है. आप आवश्यक इंटरनेट कनेक्शन के बिना स्वचालित रूप से अद्यतन करने की जरूरत है, सब प्रार्थना के साथ एक गतिशील स्मार्ट Siddur. एक पूर्ण और पूर्ण हिब्रू कैलेंडर आसान नेविगेशन के लिए एक ग्रेगोरियन कैलेंडर के साथ एकीकृत. लगभग हर जगह दुनिया में के लिए दैनिक Zemanim. Nikud थोड़ा मुश्किल है, कारण करने के लिए Android उपकरणों असंगति हो सकता है. समीक्षा सबमि‍ट करने से पहले आपको यह एप्‍लि‍केशन इंस्‍टॉल करना होगा. Google Play समीक्षाएं अब Google+ का उपयोग करती हैं इसलिए अब उन लोगों के विचारों को जानना आसान है जिनका आप ध्यान रखते हैं. नई समीक्षाएं सार्वजनिक रूप से आपकी Google+ प्रोफ़ाइल से लिंक रहेंगी. पिछली समीक्षाओं पर आपका नाम अब "Google उपयोगकर्ता" के रूप में दिखाई देगा. Hate bugs? We too. Please contact us asap via email or Facebook so we can handle the problem as soon as we can. 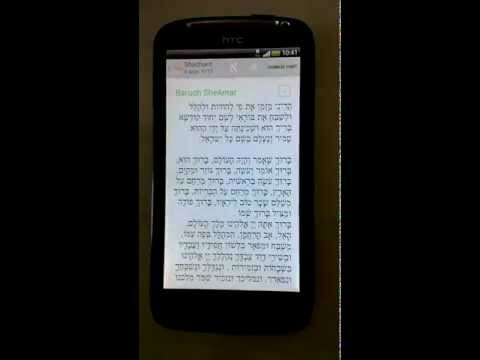 The Famous RustyBrick Siddur Comes to Android! Take your weekday siddur with you with this feature-packed Jewish prayer book. You'll get Ashkenaz, Sefard, Sefardi Mizrachi and Nusach Ari (Chabad*) versions of davening, including weekday Shacharis, Mincha, Maariv, standard Brachos and more. Real time Zmanim will give you the prayer times for each day based on your location determined with the device's GPS. A Minyanim database will help you find nearest shul. A Luach or Jewish Calendar will aid you in your prayer services. The Siddur is one of the most popular Jewish apps here and it is Rusty Brick's flagship product. We constantly update it, almost every week. Make sure to follow us on Twitter @iSiddur and keep up to date. * Chabad version has Shacharis, Mincha and Maariv for weekday. Does not have Mussaf, Hallel, and other tefillot outside of the normal weekday prayers. An upgrade is available to have all these prayers. תפילון הוא סידור חינמי שמראה את התפילה הנכונה להיום (יעלה ויבא בר"ח, על הניסים בחנוכה ופורים), ללא שימוש באינטרנט של הפלאפון. התוכנה הראשונה למכשירי אנדרואיד המציגה עברית עם ניקוד מושלם! תצוגת זמני היום ל-120 ערים ברחבי העולם. The only complete siddur available. May be used in conjunction with other siddurs but this is the only one that's really complete and contains all the prayers and additions of "regular" siddur. Now the siddur also contains Tehilim! Please note: the Shabbat and Yom Tov prayers are there only as a reference and for educational purposes. Do not read it on Shabbat and/or Yom Tov! Please note: The siddur contains voweled hebrew letters which is not supported by older versions of Android unless the phone was purchased in Israel! הסידור השלם היחיד!!! הסידור כולל את כל התפילות והתוספות הקיימות בסידור רגיל! ראיתם ברק ושמעתם רעם ואתם לא זוכרים מה לברך? הגיע חודש ניסן אבל מה מברכים בברכת האילנות? קניתם פירות בשוק ואתם צריכים לעשר אבל מהו נוסח הפרשת מעשרות? ביקשו מכם להיות עשירי בערבית (וגם חזן...) אבל אין לכם סידור עליכם? עכשיו יש! כעת הסידור כולל גם תהילים מחולק לפי ימי החודש! שימו לב: הסידור כולל את תפילות שבת ויו"ט אך ורק למטרות עיון ולימוד ולא חס וחלילה למטרות תפילה. שימו לב: הסידור עם עברית מנוקדת ולכן הסידור לא עובד על גרסאות אנדרואיד ישנות אלא אם כן הפטלפון נרכש בארץ. Very lightweight application (only about 300 KB). If you have a question or issue, please mail me. I don't have a way to answer your comments here. AndDaaven is an easy to use siddur application. It is simple out of the box, very configurable for those who want it, and tries to keep distractions away from the screen when showing tefillot. * Trackball/d-pad can be used to scroll normally, as page-up/page-down, and by section. * Volume up/down can be optionally used to scroll by page-up/page-down or by section. * Screen taps can be optionally used to scroll by page-up/page-down and by section. Please report bugs and request features on the web site or via the menu option so I can reply. CyanogenMod 7.0 contained a bug that caused the text to run off the screen and caused delays in displaying the text of tefilla. That bug is fixed in CyanogenMod 7.1. Other third-party ROMs, if they are based on CyanogenMod 7.0 may contain the same bug. Note: the Internet permission is only used to report errors in case the application crashes (and only after confirmation). "סידור לדרך " הוא הסידור שלך בכול מקום בעבודה בנסיעות ובבית והכל במקום אחד ולכולם!!! מוגש בצורה יפה ונקיה בכתב קריא ומנוקד!!! is a revolutionary new way to study the Talmud! Groundbreaking technology enhances the best-selling Schottenstein Talmud – and will allow you to study the Talmud in ways never before possible. New features like Page-syncing, Place-tracking, Page-Fusion, Floating-translation, Quick-scroll, resizable text, automatic-delivery, subscriptions – will transform your learning experience! Features have been added for all levels of Talmud students from beginner to expert. * Automatically get the first 7 Blatt/Daf of The current Daf Yomi Tractate when you install this FREE app. * The new Hybrid page will allow you to study directly on the classic Vilna page – with popups that can be configured to show you the translation, notes, and commentaries without leaving the Vilna page! * DAF YOMI SUBSCRIPTION – sign up to get automatic access to a month's worth of Daf Yomi content and have those pages automatically added permanently to your library! - Subscription automatically renews every month. No need to go back to the store! - The Daf Yomi content is downloaded automatically when you launch the app and are connected to a network - Only $9.99 a month - this not a rental - this is a purchase. * Statement types – now you can show if each section is a Statement, Question, Answer, Inquiry or Proof. English Siddur for Women (Jewish prayer book). For the Sick, Purity, Childbirth, Bar Mitzva, Marriage, Bad Dreams and much more. Ice Cream Siddur is the only free siddur designed specifically for Android 4 that contains all of weekday davening in nusach Ashkenaz, Sfard and Edot HaMizrach. The siddur contains all the text you would expect in a regular print siddur. It knows what day it is and delivers the specific tefilos for that day. This becomes especially powerful on fast days when it can deliver the appropriate selichos at shacharis and kria at mincha. It also includes a luach zmanim. Ice Cream Siddur does not require the Internet to work. Zmanim calculations are done on the phone itself using either network or GPS locations. Ice Cream Siddur includes a free English translation for nusach Ashkenaz. Enable Hebrew Helper from the Display Options Menu. Tap on a paragraph of tefila to open a dialog with the English translation. Works throughout nusach Ashkenaz and for Amida of all nuschos. Translations are adapted from the Singer Siddur. Selichos are an original translation by Shlomo Katz, a copy of his translations are available freely on Wikimedia.org. Choose between four different fonts, change the text size and set an appearance theme. You can also set the siddur to silence your device while davening. When you're done, tap "exit" from the overflow in the actionbar to reset your device's volume. הסידור היחיד המעוצב במיוחד עבור Android 4 שמכיל את כל תפילות ימי החול. הסידור הוא בנוסח אשכנז ומכיל את כל מה שנמצא בסידורים המודפסים. הוא מזהה את התאריך העברי ומראה את התפילות המתאימות לכל יום. זה שימושי במיוחד בימי צום כאשר הוא מראה את הסליחות המתאימות בשחרית ואת קריאת התורה במנחה. הוא גם מכיל את זמני היום ההלכתיים. הסידור ישתמש בנתוני GPS אם הם זמינים כדי לחשב את הזמנים ההלכתיים. אם אין נתוני GPS הסידור יפנה לנתוני הרשת. הזמנים המחושבים הם תלוים במיקום ועלולים להיות פחות מדויקים במיקומים קיצוניים (כמו בחוג הארקטי). Simple siddur - Completely updated. Now with much more content - but still in easy to use format. Hebrew fonts are installed. Although Nikud may be a little tricky, due to Android devices incompatibility. Gives you the Tehilim (Psalms) in a nice, easy to read interface. *Choose view by day of month, day in a week or by a book. *Easily find your daily Tehilim, marked in right tab. *Choose whether to read with easy reading, or with Ta'amim. *Choose theme, font and font size. *Choose whether to enter silent mode as soon as you enter the application. The application is pre-installed with Hebrew fonts, and it has already a RTL fix (can be undone from the settings). DCALC gives an easy and innovate way to check on diamonds prices. Get Rapaport prices in an efortles manner. Get your percentages from rap easily. the last update from Rapaport or not. In DCALC we understand that and that's why you don't have to do nothing in order for the application to be updated. The application will update it self automatically every Friday according to NY time to download the updated prices for you. Notice that the application will work only with a valid Rapaport login credentials. Please contact us regarding any suggestion or bug by email. We will return shortly.